Modern Bike Bollards are a multi-functional asset that provides limited access and efficient bike parking. Featuring angular arms and a bold post, each of these eye-catching bollards has capacity to secure up to 2 bicycles at the same time. Engineered ready for an array of environments, constructed with heavy-duty steel and finished in an ultra-durable powder-coating. 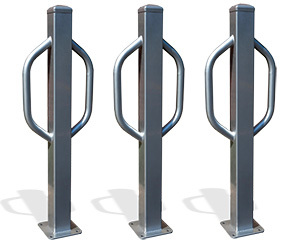 Models are configured specifically for in-ground or surface mount installations, these Modern Bike Bollards are great for both standalone applications and grouped placements.